This is National School Counseling week and I would like to update you on some of the work our dedicated student services team has undertaken this year to support our students. First of all, our Thoreau team is led by director of student services Rebecca Aguilar and consists of four counselors, a social worker, a psychologist, and our registrar. One of their many roles is to promote a culture of learning within a safe and nurturing environment. I really do believe we have a caring counseling team that strives toward ensuring that our students come to school where they feel emotionally and academically supported. To reinforce this notion of support, our school counselors - Mr. Aldridge, Mr. Fishman, Ms. Paek, and Ms. Turner - have focused on the concept of wellness this year. In a typical year, our counselors will do large group lessons in the fall and then address wellness with targeted students throughout the school year. This past fall 2018, our counselors visited all of our classrooms to teach our students how to identify and cope with stress while using mindfulness as a strategy. Succinctly put, mindfulness is a particular way of paying attention, of purposefully bringing awareness to what is happening in this moment. Coming up in spring 2019, our counselors plan to continue supporting wellness by offering yoga on Fridays, providing small-group mindfulness sessions, conducting restorative attendance circles, bringing in therapy dogs to visit our students, and more. In conclusion, I would like to acknowledge and celebrate the critical role our entire student services team plays in supporting the well-being of our Thoreau students. This week is National School Counseling week. 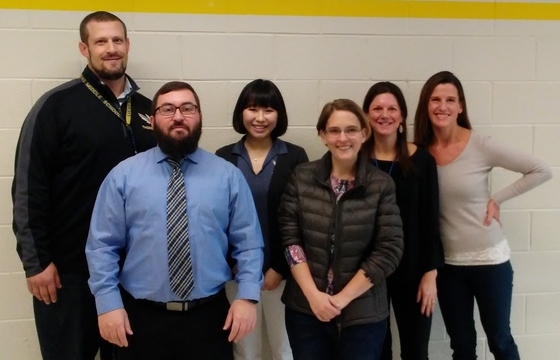 Pictured above is Thoreau's fantastic team which consists of counselors Eric Fishman, Scott Aldridge and Frangca Paek, school social worker Joy Granados, counselor Kerrie Turner, and director of student services Rebecca Aguilar. This week highlights the tremendous impact school counselors can have in helping students achieve school success and begin to plan for a career. Thoreau counselors will continue to meet with students individually to discuss course options and placements through the month of February. Thoreau counselors will conduct course presentations in mid-February and will continue to work with our rising 8th grade students and families through mid-March to complete this process. Thoreau Curriculum Night & Family Open House for our rising 7th grade families is Thursday, February 7th from 6:00 PM - 8:00 PM. Updated information and material related to academic advising can be found here. Please contact your child's counselor with questions related to this process. Thirty million Americans will struggle with an eating disorder and millions more will battle food and body image issues at some point in their lives. Eating disorders are real, complex, and devastating conditions that can have serious consequences for health, productivity and relationships. FCPS supports awareness about this issue. For further details, a parent letter and fact sheet about eating disorders can be found here. The College Partnership Program (CPP) is now accepting applications for new members. CPP is actively recruiting current 8th - 11th grade students who are motivated and will benefit from the support of this program. For more information about CPP, contact Thoreau counselor Kerrie Turner at kjturner@fcps.edu or visit the CPP website. The application deadline is Wednesday, March 13th. Students can apply online or via paper applications. Paper applications are available in English, Arabic, Korean, and Spanish. Apply online using your FCPS Google Apps for Education account here. 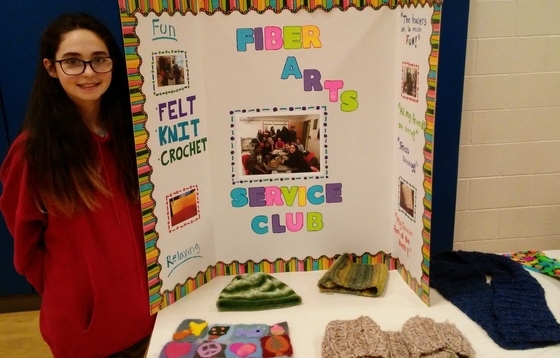 7th grade student Sasha Humen represented the Thoreau Fiber Arts Service Club in the rising 7th grade activities fair held at Thoreau this week. The club is sponsored by Thoreau English teachers Lisa Leake and Jen Wharton. Student members learn how to knit and crochet hats, scarves and blankets that are donated to a local teen shelter, and felted cat toys that are donated to a local animal shelter. This is a total group effort that provides a valuable service to our community. Current 8th grade students will take the Virginia Standards of Learning (SOL) writing test between Tuesday, March 12th and Friday, March 15th. It is important that all students attend school on these days so, if possible, please avoid scheduling any trips or appointments that would take your child out of school during this time. It is also important that your child have a good night's rest and a healthy breakfast before testing. The parent letter for the writing SOL can be found here. If you have any questions about SOL testing, please contact Thoreau testing coordinator Sunnie Chung at shchung@fcps.edu. 8th grade civics and English students focused on creating a realistic solution to a societal problem while completing a cross-curricular Project-Based Learning (PBL) presentation. Working across classes our 8th graders used research about their issue and current legislation to develop innovative solutions. We encourage parents, guardians and family members to attend the PBL presentations. Please confirm with your child when he/she will present which is based on teacher and class period. Thoreau's lost and found, which is located in the school's main office, continues to grow at close to 100 items accumulated since winter break. Please remind your child to check for lost items. All unclaimed items will be donated by February 28th. The FDA and Surgeon General have stated that e-cigarette use is an epidemic among American youth. Relatedly, FCPS is continuing to see a sharp increase in the number of students using vaping devices during the school day. Many students believe e-cigarettes are harmless, but that is not true. Most e-cigarettes contain nicotine, which is highly addictive and can impact adolescent brain development beyond the teen years. Some e-cigarettes also contain other harmful chemicals. While usage is primarily seen at the high school level, middle school students are also engaging in this harmful activity. As a reminder, FCPS' Student Rights and Responsibilities (SR&R) was updated in September 2018 to include vaping as a prohibited activity. Students found in possession of or using vape products on school grounds will participate in an FCPS intervention program and may receive disciplinary consequences. Students may face additional sanctions if they participate in a sport or activity where the Virginia High School League (VHSL) participation agreement is in place. Please visit this webpage which provides information about vaping risks, resources, and videos featuring FCPS students. Parent-focused resources on e-cigarette use can be found here. The iCanShine program is coming to Thoreau for the 10th year this spring! This is a five-day program in which the iCanShine team trains student volunteers to teach students with disabilities how to ride a two-wheel bike. The program will run every day after-school from Monday, March 18th - Friday, March 22nd. We need 20 student volunteers who are willing to commit to attending all five days of the program from 2:25 PM - 6:00 PM. Volunteers who can commit to attending all five days of the program will be accepted on a first-come, first-served basis. Parent transportation is required as we will not finish in time for students to take the late bus. Permission slips are available in Thoreau's main office. Forms are due no later than Monday, February 11th. All rising 9th grade athletes planning to attend Madison High School in the fall are invited to join the voluntary training and lifting program beginning on Monday, March 4th at 3:00 PM. This program is free, not sport-specific, and focuses on general athletic development. Parents and students are invited to a meeting about this program on Thursday, February 28th at 6:30 PM in the Madison HS weight room (next to entrance #9). Additional details can be found in this flyer. 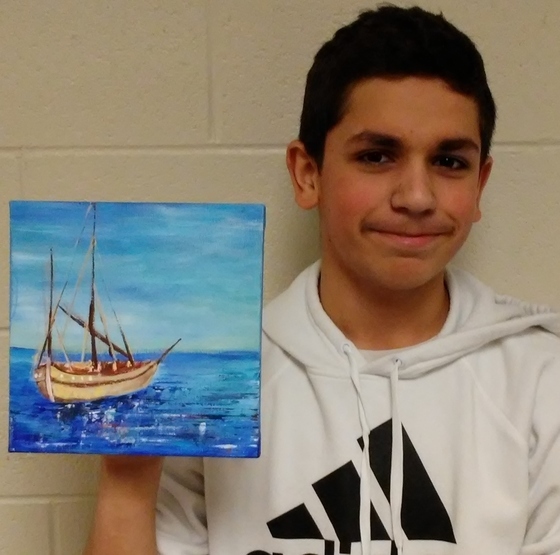 8th grade art extensions student Semih Beren received a Scholastic Art Silver Keys award for this piece. The Scholastic Art Awards is the largest and longest running recognition program of its kind in the United States. It was established in 1923 and has recognized students who have become some of our nation's most celebrated artists. More than 200,000 students from across the country, and more than 3500 from Fairfax County entered submissions. We are proud to recognize Semih's achievement. "Is there a fine line between optimism and reality?" Thoreau will be sending two contestants to the Sunday, March 10th regional competition for the chance to win up to $500 and advance to districts. Speech drafts are due to Thoreau English teacher Michelle Gabro by Friday, Februay 8th. She can be found in room A124 or contacted at mgabro@fcps.edu. All students are encouraged to enter! More QR clips of students in action than ever before! More teacher interviews than ever before! More pictures of students than ever before! Don't wait. Purchase the 2018-2019 Thoreau yearbook today! A generic version of the yearbook can be purchased at MySchoolBucks.com. To purchase an individualized version, go to Yearbookforever.com. Distribution will take place the last week of school in June. Questions? Please contact Thoreau yearbook sponsor Ms. Galeet BenZion at gbenzion@fcps.edu. If you would like to purchase an additional physical education uniform, you can do so at this time. Uniforms can be purchased online at MySchoolBucks.com. The Thoreau Spelling Bee is coming up soon on Tuesday, February 19th at 6:30 PM. The Thoreau champion will go on to compete with other regional champions in the Fairfax County Spelling Bee. Program information and word study list are emailed to students after they register. To register your child by the Friday, February 15th deadline, sign-up here. The PTA organizes monthly Spirit Nights at local restaurants who donate a percentage of their sales from these events back to Thoreau. You can help the PTA raise funds to support our school simply by eating out and inviting family, friends, and neighbors to do the same! The next spirit night will be on Tuesday, February 12th at the Outback Steakhouse located at 315 Maple Avenue E., Vienna, VA. Enjoy a meal between 4:00 PM - 10:00 PM and mention Thoreau when paying your server. The PTA is looking for a handful of members to form a nomination committee to help select officers and chairs for next year's PTA. Please email Thoreau PTA President Emily Korff at president@thoreaupta.org if you would be willing to serve. The next PTA meeting will be held at Thoreau and we would love for you to join us. Mark your calendars for Thursday, February 21st at 9:30 AM. Please join the PTA and consider making a donation to our no-fuss fundraiser. In partnership with the PTA, Thoreau Student Services will be packaging and sending home weekend food bags for families in need. We are looking for donations of non-perishable food items as identified on this Amazon shopping list. For your convenience, these items may be ordered from Amazon and delivered directly to the school. Donations may also be purchased and dropped off in the Thoreau front office to the attention of Director of Student Services Rebecca Aguilar. Gift cards are also greatly appreciated.